The Bay State was never able to use its own enrollment website to enroll anyone. (Bloomberg) – Massachusetts may still try to revamp its own Patient Protection and Affordable Care Act (PPACA) exchange enrollment site, but it could switch to using HealthCare.gov. HealthCare.gov is the system the U.S. Department of Health and Human Services (HHS) set up to handle enrollment for HHS-run exchanges. Massachusetts – the first state to set up a statewide public health insurance exchange program – has had serious problems with trying to adapt the Connector — its exchange enrollment system — to meet PPACA requirements. The state will make a final decision this summer about going with a homegrown site based on off-the-shelf technology or using HealthCare.gov, Sarah Iselin said in a telephone interview. Iselin oversees the Massachusetts exchange for Gov. Deval Patrick, D.
Oregon and Maryland have already decided to drop their state-based exchange enrollment systems and use HealthCare.gov, and officials in Hawaii and Nevada are considering making the same switch. If the Massachusetts exchange uses HealthCare.gov in 2015, that would be “a one-open-enrollment-period solution only,” Iselin said. The federal government gave Massachusetts $180 million in grants to upgrade the Connector, according to the Henry J. Kaiser Family Foundation. 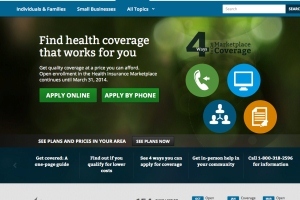 CGI Group Inc. tried to upgrade the Connector website to comply with PPACA. In October, the new version of the Connector failed readiness tests. Massachusetts used manual systems and other work-arounds to get 304,000 people signed up for new insurance coverage during the six-month PPACA open enrollment period, which officially ended March 31. But the state was never able to use the Connector to enroll people online for 2014 coverage. Patrick’s administration asked for $50 million in additional funding from the federal government in March for the Connector. The state plans to buy technology from hCentive Inc., a company with products that are used by functional exchanges in Colorado and Kentucky, Iselin said. Iselin said federal officials haven’t yet decided whether Massachusetts will get the extra money the state has requested. –With assistance from Nicole Ostrow in New York.